About "Construction of perpendicular lines"
The two lines which have the angle of inclination 90° at the point of intersection are called as perpendicular lines. Here, we are going to see, how to construct perpendicular lines. To have better understanding on constructing perpendicular lines, let us look at some examples. 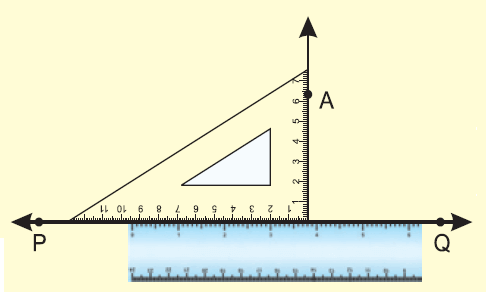 Using a set square and a ruler construct a line perpendicular to given line at a point on it. (i) Draw a line AB with the help of a ruler. (ii) Mark a point P on it. (ii) Place one edge of a set square containing the right angle along the given line AB as shown in the figure. (i) Pressing the ruler tightly with the left hand, slide the set square along the ruler till the edge of the set square touches the point P.
(ii) Through P, draw a line PQ along the edge. Using a set square and a ruler draw a line perpendicular to the given line through a point above it. (ii) Place one edge of a set square containing the right angle along the given line PQ as shown in the figure. (ii) Through A draw a line AO along the edge. (i) AO is the required line perpendicular to PQ. After having gone through the stuff given above, we hope that the students would have understood "Constructing perpendicular lines". Apart from the stuff given above, if you want to know more about "Constructing perpendicular lines", please click here.